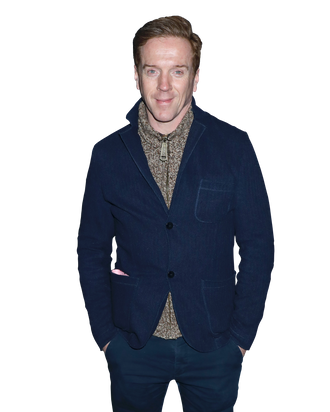 The most important question I had for Billions star Damian Lewis was this: Are Bobby Axelrod’s cashmere zip-up hoodies as soft as they look onscreen? We can talk about his Rob Ford movie and everything else later, but the hoodies must have their moment. Billions is a show about the dramatics of Wall Street’s rich and powerful — fancy restaurants, words like “devalue” and “quant” — but Axe’s hoodies signify everything that makes his character simultaneously the best and the freaking worst. He’s brash and cool, and so grossly willing to show it off just for fun. And so, I ask Lewis, does a $2,000 cashmere hoodie really feel like a $2,000 cashmere hoodie? The tables have turned in Billions’ fourth season — Axe is no longer butting heads with Chuck Rhodes (grumpy icon Paul Giamatti), who for three seasons has been his perma-nemesis — but Lewis still says he’s having as much fun with its dramatics as ever before. Ahead of Sunday night’s episode “Arousal Template,” we talked Axe and Chuck’s alliance, the world’s most famous Billions fan, and, of course, that cashmere. A lot of the dynamics that were central to Billions have been inverted this season: Axe and Chuck are in cahoots. Taylor, once Axe’s prodigy, is now his nemesis. Has that been weird for you? It’s very exciting. I think it’s also quite realistic, the way in which alliances are made and don’t always last too long. Billions is about the transactional nature of the rich and the powerful, or even modern-day living. It’s a show about the favor trading that goes on, the you scratch my back, I’ll scratch yours. If the parameters don’t exist, really, like they do for normal people, let’s do each other a favor to get me what I want, to get you what you want. You’ve got a juicy drama of alliances and betrayal ahead of you. Chuck and Bobby have set this alliance because they both need it. Did you ever think that Axe and Chuck could be on the same side? There was a conversation quite early on, after season one, about how long can these two just keep whacking each other over the head with a mallet? I thought there was always the likelihood that the story would soon diverge in some way. We have to find ways of making the world interesting, of making New York interesting, without it just being about Bobby and Chuck killing each other. That would’ve become repetitive. I think it’s just the right time for these two to form an alliance. They will have their their predicaments and their own obstacles to overcome in their own particular lives. It’s not like all the conflict is disappeared out of the show. In Sunday’s episode, Axe meets a powerful finance type named Rebecca Cantu and he asks her out. What do you make of this relationship? It’s one of Axe’s saving redeeming qualities that he admires peoples’ intellect. I’m not sure Axe is saveable anymore, but it is a redeeming quality, in the same way that he never judged Taylor when they announced that they’re gender non-binary. Axe was very open-minded and liberal because he was only interested in their brilliance. In the same way with Rebecca, I think he’s interested in her brilliance. There’s a kinship there. They’re both ball breakers. They are both very wealthy, both very successful. That’s why he’s drawn to her. What do you think bothers Bobby the most about Taylor starting their own firm? It’s obviously much deeper than him being competitive. Betrayal. I’ll never forget George Bush Jr. saying, “You’re either with us or against us.” He made that sort of binary statement. Bobby is like that. He wants loyalty, and that’s it. Trump throws that word around a lot. Interestingly, a character like Taylor is moving forward a conversation — as Asia is, themself — about looking at things in a less binary way. Axe, nevertheless, is absolutely entrenched in a binary view of the world. Certainly where he’s concerned, and certainly where loyalty to him is concerned. The greatest sin is for Axe to have spent time nurturing and raising Taylor, only for them to fly the nest and set up shop against him. That, in Axe’s world, is unforgivable. Billions is a show about money and power, so I’m curious what your biggest financial extravagance is. My biggest extravagance is probably guitars. I don’t have anything crazy. I have four guitars, and I just buy them when I’m in different places. I have a guitar for when I’m in New York. I have a guitar in London. I just have two vintage guitars for my children. I like guitars. The most famous Homeland fan was President Obama. Who’s the most famous Billions fan, as far as you know? I just talked to the former attorney general, Mr. Eric Holder, and he said he absolutely loved the show. I’m going to invite him on set and hopefully he’ll come visit. He’s a very famous guy. What can you tell me about Run This Town, where you’re playing the infamous Toronto mayor Rob Ford? It has a direct parallel with what’s going on here in America. Rob Ford was a populist, slogan-shouting politician with very little grasp of policy, but he somehow managed to endear himself to the electorate by seeming to be one of the guys. It’s not a Rob Ford biopic. It’s more a story about the effect of his actions on the people that work with him and the people around him. I very much liked the idea of playing him. I thought any director who’s crazy enough to call me up and ask me if I’d like to play Rob Ford would be an interesting guy to work with, and Ricky Tollman has done a fantastic job of it. I hope people see it. That first photo of you in costume was so shocking. How did you react to seeing yourself all dressed up as Rob Ford for the first time? I was amazed. The effects guys who specialize in special effects and latex suits, they did an incredible job. You look at yourself and say, wow. I think I’m pretty unrecognizable. In fact, it could be anyone under there. It might not even be me! This is totally unrelated, but you are the reason Timothée Chalamet was cast in Call Me by Your Name, I’ve heard. Okay, I joke that I made Timothée Chalamet. He was in Homeland, and I did make a call to my agent Brian Swardstrom and said, “I think you should get on the phone right away with this kid, because I think very soon, everyone’s going to be on the phone with him.” Brian did and they got together. It is probably true, given that Brian’s husband was producing Call Me by Your Name, that I had something to do with the fact that Timothée ended up in that movie. I didn’t make Timothée Chalamet. Although, of course, when I see him I tell him I did.